In addition to the animated movies with a variety of anthropomorphics, animals and anthropomorphic animals coming out some time this year, there are four major live action releases this year that furries may want to mark on their calendar: Dawn of the Planet of the Apes, Guardians of the Galaxy, The Hobbit: There and Back Again and Teenage Mutant Ninja Turtles. Dates listed are for North American releases. Furries in other areas of the world may have to wait a bit longer, but all four are big blockbuster type movies counting on worldwide revenue; be patient and they’ll reach you eventually. 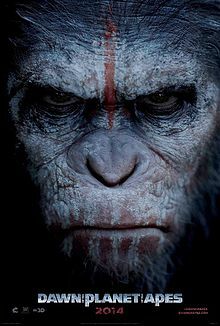 The first of the four movies spotlighted doesn’t come out until July 11, and it is the sequel to the surprise hit of 2011, Rise of the Planet of the Apes. This sequel, directed by Matt Reeves after Rise director Rupert Wyatt left the project, takes place approximately fifteen years after the events of Rise. Caesar, played via motion capture by Andy Serkis, leads the apes, who come in contact with one of the last surviving groups of humans left on the planet. These two groups try to live together peacefully, but don’t. Also stars Gary Oldman, Keri Russell and Judy Greer as Cornelia. August features two furry live action movies, with Marvel Studios’ Guardians of the Galaxy coming first on August 1. Part of the “Marvel Cinematic Universe,” this represents a bizarre side chapter for the franchise, as the titular Guardians could most favorably be described as “cult” comic book characters. Even more bizarre is the choice of James Gunn as screenwriter and director, whose work on horror/comedy Slither and dark superhero comedy Super could also be described favorably as cult. The furry factor comes from team member Rocket Raccoon, voiced by two time Academy Award nominated actor Bradley Cooper. Also stars Chris Pratt, Zoe Saldana and Vin Diesel as Groot. The second furry comic book adaptation of the month, Teenage Mutant Ninja Turtles hits theaters one week after Guardians of the Galaxy on August 8. The movie, directed by Jonathan Liebesman, has been in development hell since forever; it ignores the four previous TMNT movies and features its own continuity. We know for sure Leonardo (Pete Ploszek), Raphael (Alan Ritchson), Donatello (Jeremy Howard) and Michelangelo (Noel Fisher) are ninja turtles, probably teenaged, though the “mutant” thing has been up in the air ever since producer Michael Bay announced prematurely they were actually aliens this time. That version of the story seems to have thankfully gone away. Also stars Megan Fox, William Fichtner and Danny Woodburn as Splinter. Last year’s The Hobbit: The Desolation of Smaug by director Peter Jackson will probably go down as the furriest of the three movies in this prequel trilogy to another well-beloved cinematic trilogy, which is historically always a good thing. But the titular dragon Smaug was still flying around at the end of that movie, and werebear Beorn, though appearing briefly in The Desolation of Smaug, should make a reappearance in the climactic battle of this film on December 17, if the book is anything to go on. So, there are those two things. Hopefully Bilbo Baggins, played wonderfully by Martin Freeman, will get a bit more screen time in his own movie this go around. Which he won’t, if the book is anything to go on. Also stars Richard Armitage, Orlando Bloom and Benedict Cumberbatch as Smaug. Please note that I left off the upcoming Muppet movie for a reason; not because it isn't worth furries' attention and not because I'm not excited for it (I'd say I'm more excited for it than two movies featured here), but since it comes out next month, I was fairly certain we were all very aware of it anyway. But seriously, you're mistaken to assume I spend any time watching promos or keeping abreast of current cinema outside of Flayrah. I actually preferred the movie's original title, which was The Muppets: Again. I can't even for the life of me remember what the subtitle for the movie is now; something generic and I don't care, but the trailers were funny. Sources suggest it's Muppets Most Wanted, though I guess that's technically not a sub-title. Yes, I have access to Google, too. Totally excited for Guardians Of The Galaxy! !